This article is about the village in the UK. For the community in the United States, see Wilford, Idaho. For people named Wilford, see Wilford (surname). 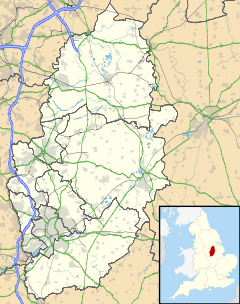 Wilford is a village close to the centre of the city of Nottingham, UK. It is in the Clifton North Ward of Nottingham Unitary Authority. The village is bounded to the north and west by the River Trent and to the east by the embankment of the now closed Great Central Railway. Remains of a paved ford, bordered by oak posts, were found in the Trent at Wilford in 1900. The settlement is named as Willesforde in Domesday Book, owned by William Pevrel of Nottingham Castle, who also owned the lands of nearby Clifton. It had a fishery, a priest and 23 sokemen. The land passed to the Clifton family in the 13th Century. Wilford retained its identity as a village until the later 19th century. Surrounded by woodlands and with riverside amenities such as the Wilford Ferry Inn, the village attracted many visitors from Nottingham. Spencer Hall, the Nottinghamshire poet, wrote in 1846 "Who ever saw Wilford without wishing to become an inmate of one of its peaceful woodbined homes." In 1870 the Clifton Colliery opened on the north side of the Trent, and the area opposite Wilford became industrialised. By the end of the century the village had changed character, with modern brick-built houses replacing old thatched cottages. The parish was divided into North Wilford and South Wilford in 1887. The population increased to four and a half thousand by 1901, almost a ten-fold increase since 1801. The now demolished coal-fired Wilford Power Station was built in the early 1920's on the north bank of the River Trent. The civil parish of South Wilford became part of West Bridgford urban district in 1935. The Silverdale housing estate was built on the southern edge of Wilford on farmland. An adjacent estate, Compton Acres, was built in 1986. The church of St Wilfrid serves a parish covering Wilford, Silverdale and a large part of the Compton Acres estate. The church contains two memorials to the Nottingham poet Henry Kirke White who drew much of his inspiration from Wilford and Clifton. The churchyard contains war graves of eight soldiers of World War I and an airman of World War II. Wilford is served by two stops of the Nottingham Express Transit system. Both Wilford Village and Wilford Lane stops are on line 2, linking the city centre to Clifton, and opened in August 2015. Wilford has a number of sports clubs for football, rugby, basketball, bowls and archery. Nottingham Moderns Rugby Club is an amateur rugby club playing in the RFU league system. They have pitches and a clubhouse located between the Ferry Inn pub and the toll bridge. Wilford has a Co-operative Local Store, a Social and Bowls Club, the Tailor's Arms (formerly the Wilford Green), the Ferry Inn (a branch of the Chef and Brewer restaurant chain) and the Wilford Farm Harvester (a restaurant of the Harvester chain). Close by is the Gresham Sports Pavilion which includes an all-weather football pitch, and indoor changing facilities. Across Wilford Toll Bridge is Victoria Embankment, which hosts the annual Riverside Festival, the War Memorial and park, and a children's play-area and large paddling pool. The toll bridge was converted to a foot bridge in the early 1970s. Gleeds, an architects and surveyors company has its headquarters here. A number of companies are based at Wilford Industrial Estate, including Seriff, a large supplies distribution company, and A. W. Consulting, a small marketing consultancy, owing to the area's proximity to the A52 and access to the M1. Marjorie Bates lived in The Grange (now Grange Close). She was an artist specialising in watercolour and pastels, who painted a number of views of the village. Laura Knight, distantly related to Majorie Bates, visited the village many times, also basing much of her work on the surrounding environment. Captain John Deane, an adventurer and mercenary, lived in the village. His ship The Nottingham Galley sank off the coast of Boon Island, New England in 1710. Deane and his crew, trapped on the island, were forced to cannibalise a corpse shortly before being rescued. Deane subsequently served in the Russian navy under Peter the Great, and retired to Wilford in 1736. He is buried in the grounds of Wilford Church. William Wilberforce lived in Wilford for a short time whilst writing his bill for the abolition of slavery. Jeremiah Brandreth was born here in 1790. In 1817 he participated in a conspiracy to overthrow the government, was arrested, tried for treason and hung with two accomplices. Their corpses were decapitated with an axe. Benjamin Carter founded the local primary school, whilst also establishing much housing and charitable help throughout Wilford. In 1908, Jesse Boot built the Dorothy Boot Homes (11 homes, a clubroom and library) in Wilford, for veterans of the Crimean War and Indian Mutiny. Dominic Heale from East Midlands Today lives in the village. ^ "Nottingham Express Transit Phase 2 opens". Railway Gazette. DVV Media UK Ltd. 25 August 2015. Archived from the original on 28 August 2015. Retrieved 25 August 2015. Wikimedia Commons has media related to Wilford.